Talk about a flash back! Those who follow my blog for a while might remember my favorite group virtual event, The Secret Recipe Club. Food bloggers were paired in secret, and had a few weeks to stalk the assigned blog, pick a recipe and blog about it on Reveal Day. Every post would go live at the exact same time, midnight of the first Monday of the month, New York time. I was a member for years, and had a lot of fun with it. Not only for the cooking aspect, but for its social component. SRC had it’s last appearance in November 2016, but our beloved organizer, Sarah, had the idea of a special encore that celebrates the 10th year anniversary of its creation. So here we are, one final time! I was assigned pure royalty in food blog shape. I got Sarah’s food blog, Fantastical Sharing of Recipes! Can you believe it? The queen behind my favorite event! I was assigned her blog in the past as pretty much every member rotated through every blog in the group. At that time, I made a fantastical recipe as you can see here. 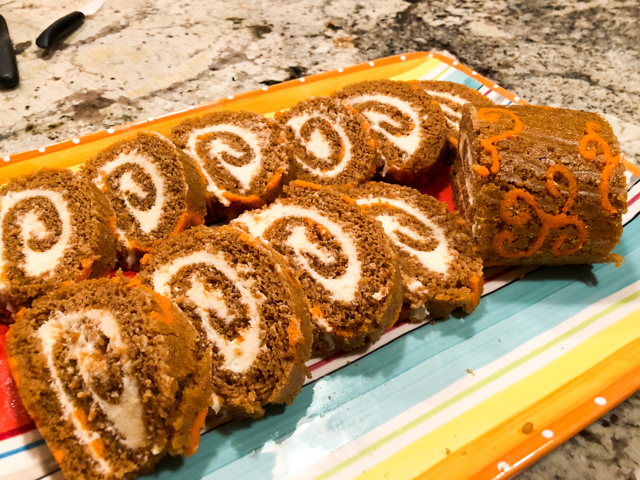 Now I share another fantastical recipe, a Carrot Cake Roll with Cream Cheese Icing. OMG OMG OMG. Because this is such a special occasion, I felt like dressing it up a little, and tried my hands at adding a pattern on the surface of the cake. One word: THRILL! Make the piping decoration by beating the butter with powdered sugar in a small bowl until fully combined. 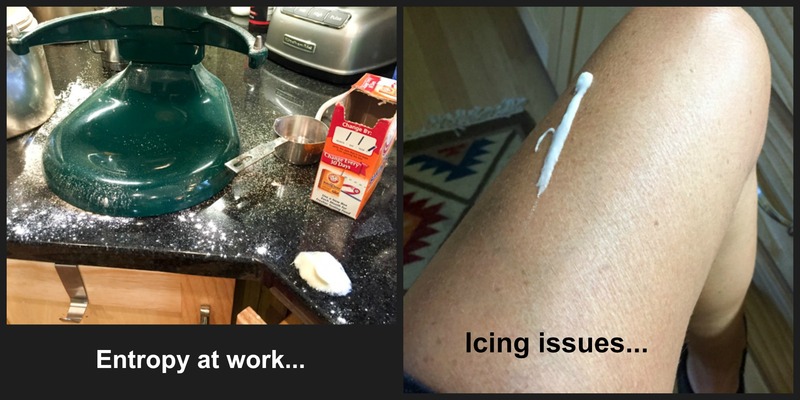 I used a hand-held electric mixer. Add the egg whites and beat for a couple of minutes. Add the flour and mix by hand with a spoon, add a couple of drops of orange food color. Reserve. 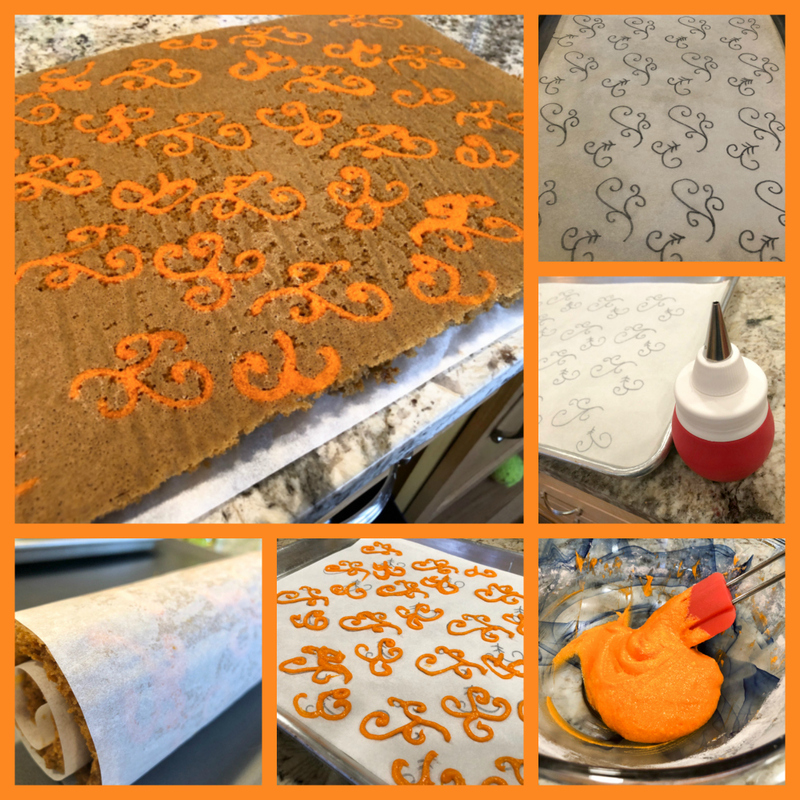 Draw the design you want to have on the surface of the cake with a pencil on parchment paper that fits a half-sheet baking pan. Invert the paper so that the pencil mark is at the bottom. Pipe the icing using a very thin piping tip. Freeze the whole tray with the decoration for at least one hour. When the time is almost up, prepare the cake batter. Beat eggs on high-speed for 5 minutes until they are dark yellow and frothy. Add sugar and vanilla and beat. In a medium bowl, whisk together salt, baking powder, ginger, nutmeg, cinnamon, and flour. Stir dry ingredients into wet until just combined. Then stir in carrots. 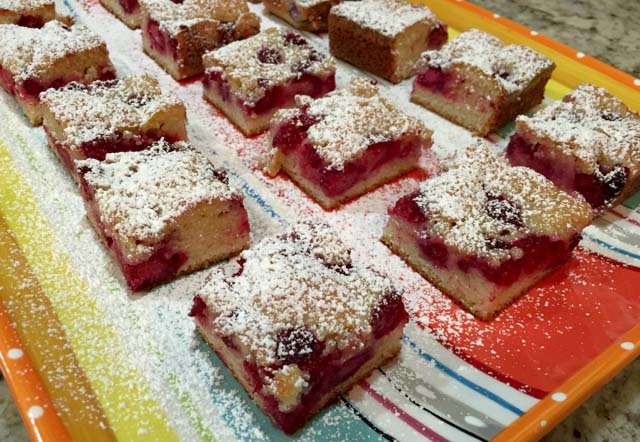 Remove baking sheet from the freezer, and quickly spread the batter on top of the decorations. Gently bang the pan so that the batter gets well into the design. Bake for about 15 minutes until done, it should spring back gently when you press your finger at the center of the cake. You will need to flip the cake twice, first time the pattern will be up, but you will need to flip it again so that it will be down, and once the cake is rolled, it will be on the outside surface. On the second time, flip it over parchment paper sprinkled with sugar. Roll the cake while still warm, and let it cool completely, about one hour. Make the filling: beat butter and cream cheese together until smooth. Add powdered sugar and vanilla, and beat again until nice and smooth. Unroll cake, spread filling evenly, then roll it back. Chill in fridge for at least one hour to firm it up. Comments: Public thank you goes for my dear friend Gary, Patissier Extraordinaire, for his advice on the piping technique. I used my new gadget, the silicone bulb with a very fine piping tip (featured here), and was pretty pleased with the way it worked. The amount of piping icing made would be enough to cover three cakes, but particularly on my first time doing it, I decided that having extra icing was better than not enough. And, by the way, this was also my first time making a rolled cake! I was quite happy with the outcome, although as usual, there is room for improvement. A small crack happened in one side of the cake, but it was not too bad. Considering the types of tragedy I’ve endured during cake baking, this was nothing. Our departmental colleagues loved the cake! 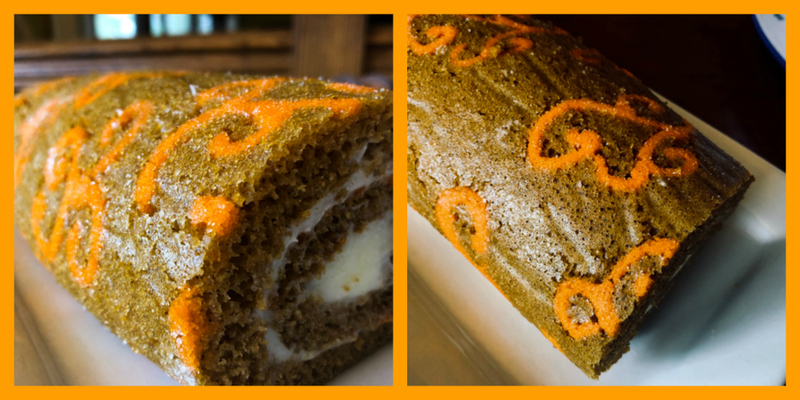 It was very moist, warm due to all spices, and the cream cheese filling takes it over the top. I cannot wait to try another type of rolled cake and a bit more elaborate patterns. The trickiest part of this recipe was flipping the cake twice, I think it would be easier to wait maybe a few more minutes before doing that, the crack actually happened during flipping, not rolling. The cake was a bit too warm and still very moist from the oven. Live and learn. Sarah, I am so thrilled I got your blog for this special reunion! Really felt like closing the Secret Recipe Club chapter with a golden key! 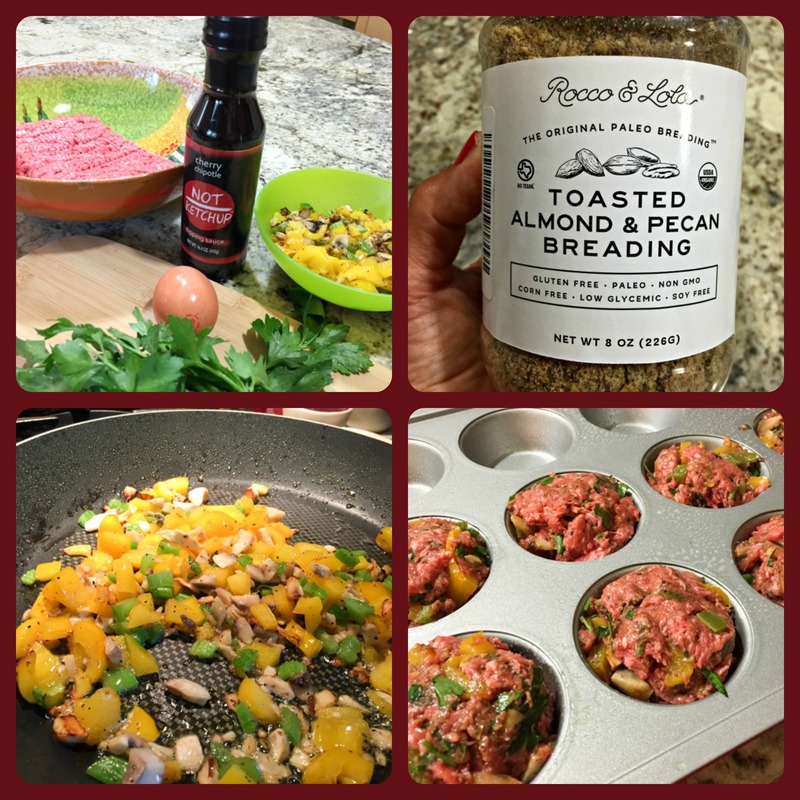 I invite all my readers to browse through the recipes posted by all members of SRC following the link at the end of my post. THREE YEARS AGO: Cauliflower Tortillas: Going low-carb and loving it! Even if I trim the fat, or salt, or sugar, it has to taste fabulous. If it tastes like cardboard, I don’t care how healthy it is, no one will eat it. And where’s the joy in that? I have a shockingly long list of stuff that I bookmarked as possibilities for this post. A few examples to water your mouth are: Farro Date Salad with Mango and Arugula… Chicken Brie and Apple Turnovers… Sticky Lemon Oregano Chicken… Popeye Pasta… World’s Best Smoky Burger (oh, yeah…), Angel Hair Pasta with Lemon, Kale, and Pecans… Flourless Oat Caramel Cookies (swoon! )… Crunchy Granola Bars better than Nature Valley… or how about Slow-Cooker Paleo Ribs in Tablecloth Stainer Sauce? So, what did I pick? 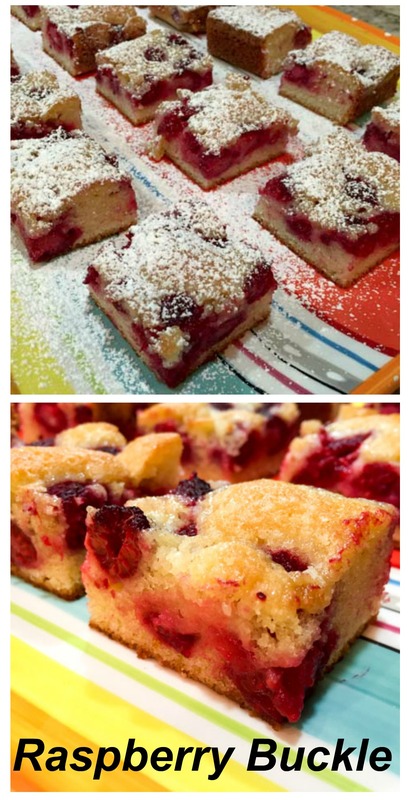 I had to go with two recipes, just because…. 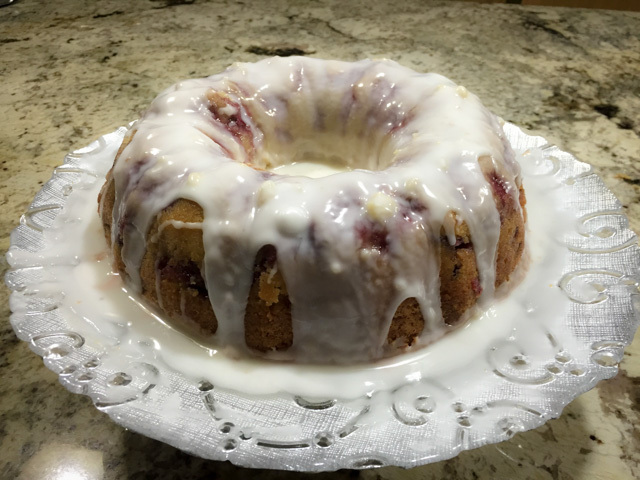 first, a Fresh Strawberry Yogurt Bundt Cake, because if you cannot face your cake baking demons in the name of a great food blog, there’s gotta be something wrong with you! And the following week I made the cutest meatloaves ever: Cherry Chipotle Meat Loaf Cupcakes. Both were… how should I put it? Shockingly Delicious! With an electric mixer, cream together the butter and sugar until light and fluffy. Beat in the eggs one at a time, then stir in lemon juice and almond extract. Alternate beating in the flour mixture and the yogurt, mixing just until incorporated. Gently stir strawberries into the batter. Pour the batter into the Bundt pan. Bake for 70-75 minutes, or until a wooden pick inserted into the center of the cake comes out clean. Allow to cool 25 minutes in the pan, then turn out onto a wire rack and cool completely. Once cooled, whisk together the powdered sugar and lemon juice in a small bowl. Drizzle glaze over top of the cake, letting it drip down the sides. 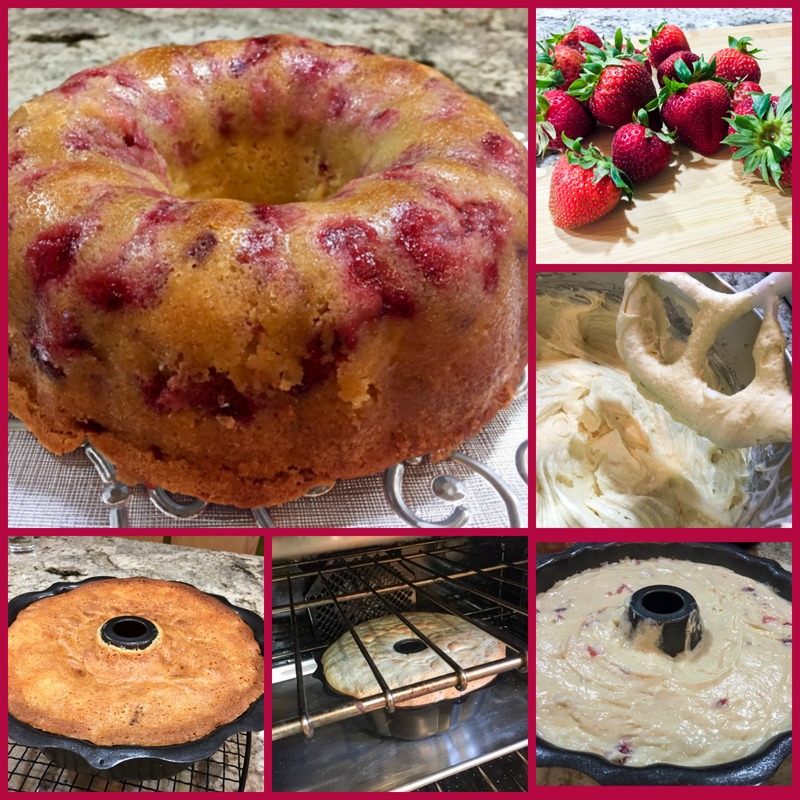 Comments: One of the things I loved about this cake is that the recipe calls for enough batter to actually fill the Bundt pan to the appropriate level. More often than not, I face the problem of the disappearing cake batter: no matter how closely I follow the instructions, it seems the amount is never adequate. Not this time. And the smell, while baking was intoxicating, in the best possible way… Of course, un-molding a cake from a Bundt pan can be quite stressful, I could feel my heart pounding as I negotiated the big hot pan, the rack underneath it, the kitchen cloth, and the hot pad. Tap, tap, tap, hope, hope, hope, and voilà the thing of beauty, smooth and fragrant, out of the pan in a single piece! There was a happy dance. With a shriek (a la Karen). 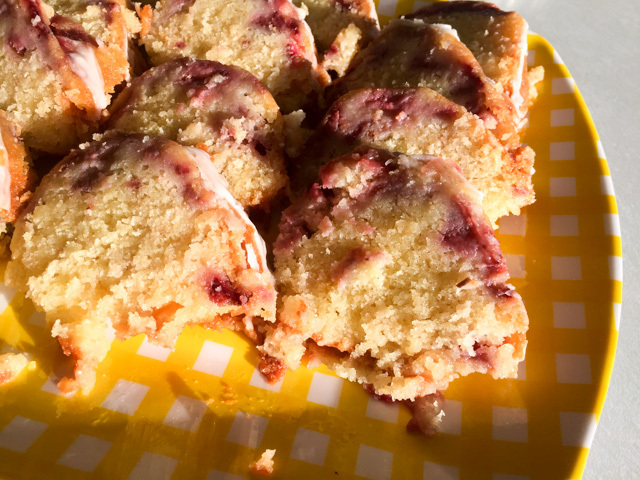 I glazed the cake next morning, very early, then sliced it and took the full batch to our department, because the best part of baking a cake is sharing it. The cake disappeared fast. 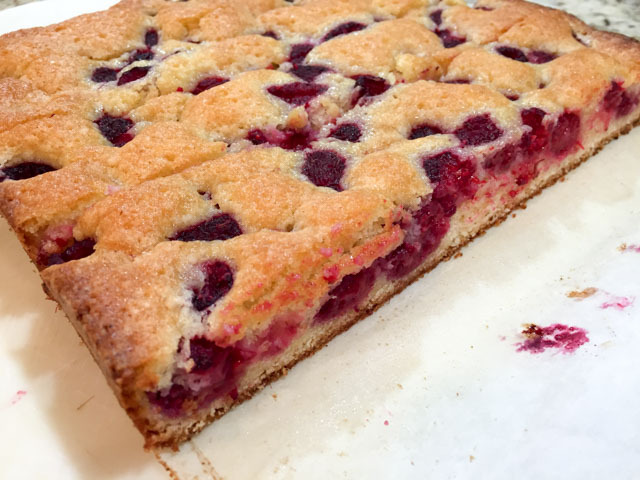 It was exactly what Dorothy promised it to be, very moist, excellent lemony flavor, the sweetness of the strawberries a perfect addiction to the smooth crumb. Of course, where there is cake, there is agony. Turning the Kitchen Aid on with the paddle still up, that was a mistake. Flour in the eyebrows, anyone? And the correct place for icing is definitely not the human thigh, although the pups could disagree. They were following me around for a while even after I washed it all off. 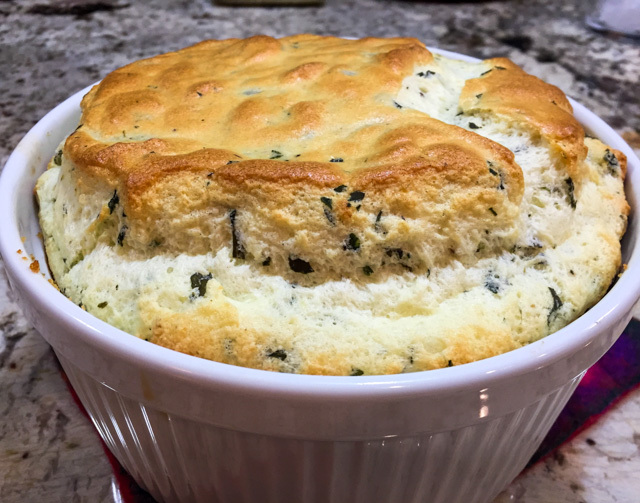 Before I say goodbye, one more featured recipe from Dorothy’s great blog! Heat oven to 375 degrees. Make vegetable mixture: Heat oil in a skillet on medium heat. Add shallots, carrots, celery, mushrooms, peppers, oregano, thyme, salt and pepper and sauté until vegetables are soft, about 5 minutes. Turn heat off and remove pan from burner; set aside to cool for 5-10 minutes. 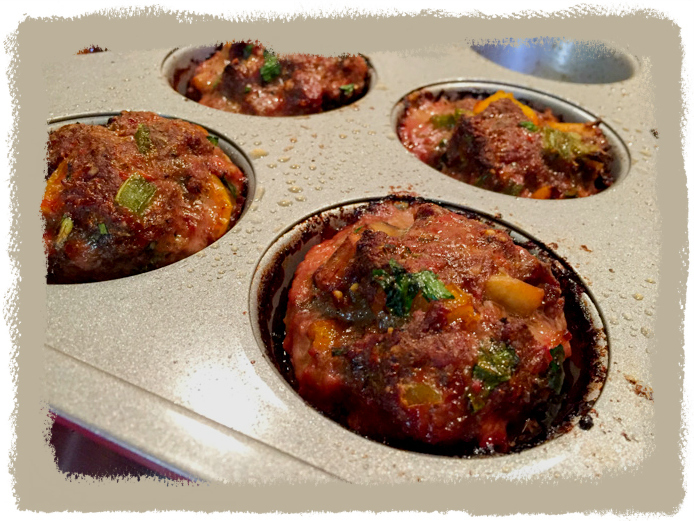 Make meat loaf cupcakes: In a large mixing bowl, combine vegetable mixture, beef, almond flour, Dijon, egg, Not Ketchup, and parsley. Use hands to combine well. Lightly oil 8 muffin tins. Divide meat loaf mixture among 8 muffin cups. Bake for 25 minutes or until cooked through. Remove pan from oven and cool for a couple of minutes. Comments: How could I resist meatloaves in cupcake format? User friendly, impossibly cute, and giving me the chance to try a new product, the “Not Ketchup”, praised by Dorothy in her blog. Not Ketchup comes in several flavors and is produced by another food blogger I follow, Erika from Erika’s Kitchen. It is very tasty, like a grownup ketchup with very complex flavor and not as sweet as your regular kind. I loved it so much that I placed another order for her Tangerine Hatch Chile version, apparently even lower in carbs. For the meatloaves I replaced regular breadcrumbs with Toasted Almond & Pecan Breading, a product that was a bit of an impulse buy on amazon. They often show a list of suggestions based on your previous searches, and I fell for this one. I do realize I could make my own almond-based crumbs, but every once in a while I like to splurge. I was very pleased by this product, actually. It smells amazing, and offered the right texture to the loaves, not dry at all. If you’d like to try it, click here. (I am not affiliated with amazon, and will not make a single penny from your purchase). We loved these little loaves! The recipe made eight little servings, half of them were gone for our dinner, the others enjoyed for lunch two days in a row, they re-heat beautifully in the microwave. Between you and me, they taste fantastic straight from the fridge, but if you do that, be discreet and take tiny morsels from the bottom, so no one will notice. Dorothy, as you imagine, I could hardly contain my excitement when the email arrived with your blog as my assigned site to stalk… I hope you had a blast with yours too this month! And be ready to jump on the next one, because I am revving my engines, baby…. As usual, my readers are invited to browse through the collection of recipes posted by other members of Group A of The Secret Recipe Club. Just poke the frog and be ready for some virtual fun! The Secret Recipe Club is an event that pairs two food bloggers in secret. Once we get our “assignment”, we have about 3 weeks to browse through the site, choose a recipe from it, cook and blog about it at midnight of Reveal Monday. I’ve been a member for a long time, but I still remember exactly how it felt when I joined. Those “newbie” feelings, never quite sure if your write-up, photos, chosen recipe were good enough. I got to know amazing food blogs through the SRC, and that is a bonus like no other. Long before I joined the club, I was a faithful follower of a very unique blog, called Chef in Disguise. At some point in the not too distant past, Sawsan, the hostess of that site, joined The Secret Recipe Club, and when I learned about that, my heart missed a beat, out of pure thrill. And then it missed another beat, from disappointment. Disappointment because she was not in my group. At that time there were four different groups. I was part of Group D, she was placed in Group A. Bummer. But it so happens that major changes took place, instead of four separate groups we now have three, bloggers moved around, and voilà: I found myself sitting in Group A. But, what’s even better, today I have the greatest honor and pleasure of cooking from her site. Those are incredibly big shoes to fill, Sawsan is an outstanding cook, photographer, and writer. But having interacted with her over many years through emails and comments I also know she is an amazing human being. Kind, generous, loving, devoted to her family, friends, profession, and culture. 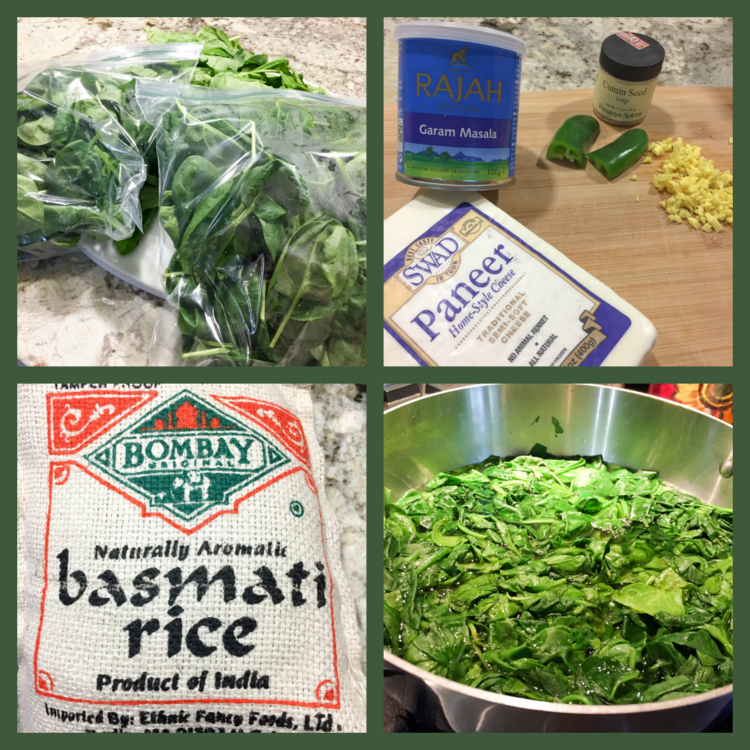 Through her blog, I learned so much more than cooking. Just to offer you a very small but representative example: in this post she explains Ramadan and does so in a beautiful, profound and touching way. But that’s just one example. Sawsan’s mission is to open her kitchen and home to people all over the world. You’ll find stories of her family as she grew up, stories of her kids adventures in school or how they are all dealing with moving from Jordan to UAE. You will also find recipes ranging from straightforward to incredibly sophisticated. There is simply nothing she won’t try and then excel at. You don’t believe me? Take a look at this cake she made for her son. Or this one for her daughter. And when she does this type of challenging projects, she makes sure that anyone can follow her steps, by writing very detailed tutorials. These “how to” posts are amazing sources of information, a bit like having a teacher holding your hand. As usual, I like to make a list of the recipes that I considered for this Reveal Day. From Chef in Disguise, my list was a mile long, but I will take a minimalist approach: Pão de Queijo (because I was thrilled to see her making a typical Brazilian concoction), Date Bread Rings, Cheese and Anise Flat Bread, Mille-feuille for home-made Napoleon, Braided Date Bread (almost made this one…), Lavender Chicken, Pavlova (always wanted to give this one a try), Kabsa (irresistible rice and meat concoction from the Arabian gulf). But I also want to offer you four examples of tutorials that are a must-read: How to make Labneh Cheese… How to make Feta Cheese… How to make mozzarella and armenian string cheese… and another one very dear to my heart: Sourdough starter 101: how to create your sourdough starter from scratch. So, what did I pick? For starters, Falafel. Not an easy choice, because a couple of years ago I had an epic disaster in the kitchen attempting to make them. Our dear friend Cindy had traveled all the way from Oklahoma to visit us and one of our goals was to make falafel together. Things seemed to be going well, but when we got to the part of frying them, they disintegrated in the oil, every single one of them! It was a royal mess, we had to resort to a plan B for our dinner. I confess that when I have this type of problem with a recipe, I usually avoid attempting it again for a while (in Sally’s speak: for a while = forever). But Sawsan’s post was my chance to do it right. I was quite nervous about it, but here I am to report back: HUGE SUCCESS! A personal culinary demon has been exorcised for good! 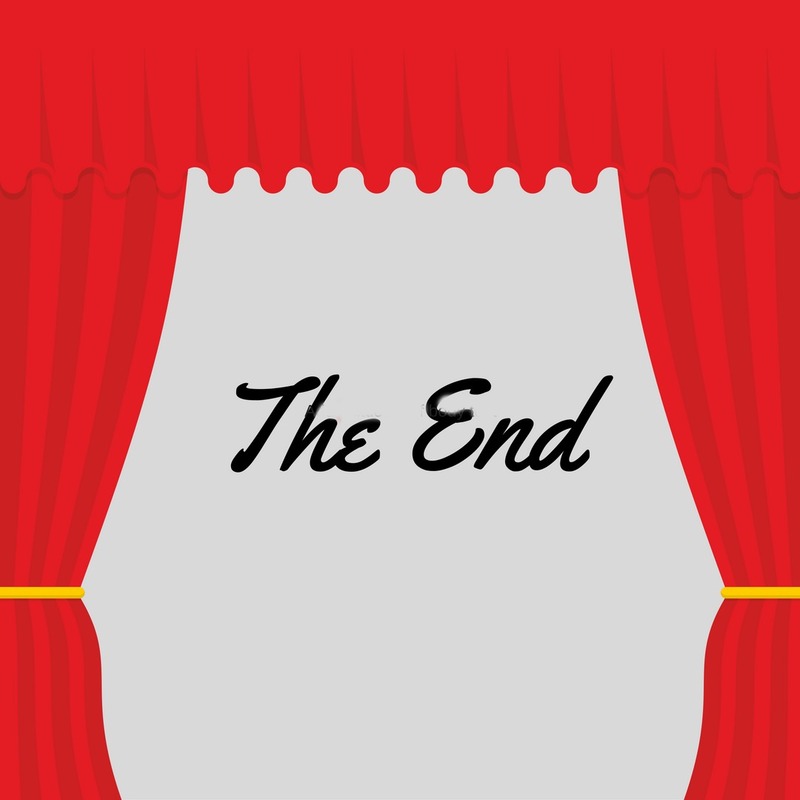 (Just when I finished editing and scheduling this post, Sawsan published a new article. I won’t say a word about it. Because once again, she’s said it all). Prepare the Falafel Mix: Soak the fava beans and the chickpeas in water in separate containers overnight. The following day drain the fava beans and the chickpeas, rinse them with fresh water. You should weigh them after soaking, and place the required amount in the bowl of a food processor. Process the grains together until smooth, remove from the processor and add the shallot, parsley, cilantro, salt, peppers, and spices to the empty processor. Process until a paste forms, add the grains back and process everything together until very smooth. Scrape the sides of the bowl a couple of times so that you’ll end up without large chunks of grains. You can freeze the mixture at this point or place it in the fridge for a few days. Ten minutes before frying, sprinkle baking soda and baking powder on the falafel mix, knead and let rest. When ready heat 1 inch deep of cooking oil in the frying pan on medium heat. 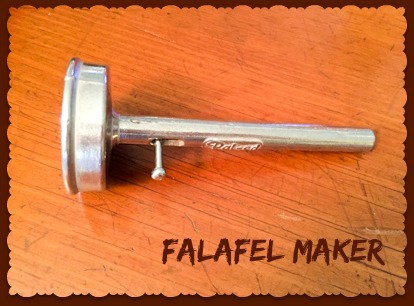 Scoop the falafel by using a specialized Falafel scoop, an ice cream scoop, or by using 2 spoons whereby you scoop the falafel paste in one, and press the other spoon against it to compact it into an oval shape. You can also use your hands to roll the falafel into balls. Drop the falafel gently into the frying pan. 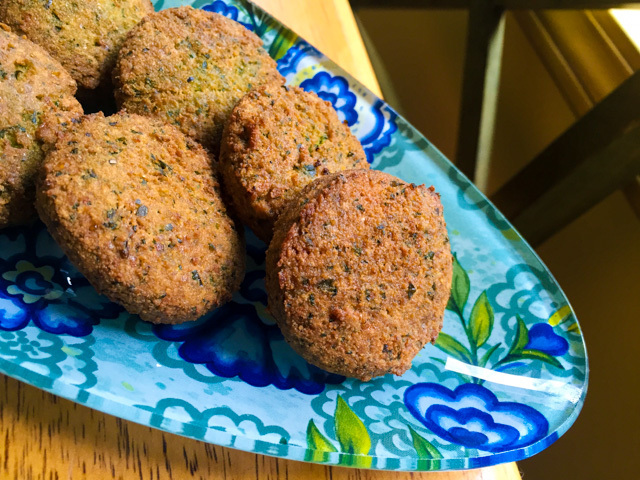 no more than 4-5 because if you add too many the oil will cool down and the falafel will fall apart Fry for a few minutes until the falafel turns brownish, flipping it once to brown both sides. Take the falafel out and place it on a paper towel to get rid of excess oil. Make the sauce: mix the Tahini sauce ingredients in a small bowl until you get the right texture, you can add a bit more water or lemon juice if necessary. Taste and adjust seasoning. Serve as a dip or spoon some over the falafel on your plate. I made the falafel mixture two days before actually frying them. Kept the bowl in the fridge, then kneaded the baking powder and baking soda right before cooking them, as instructed by Sawsan. To my amazement, not a single one dissolved in the oil, and the taste… out of this world delicious! I used a heavy hand with the herbs, so mine turned out a bit more green than Sawsan’s. 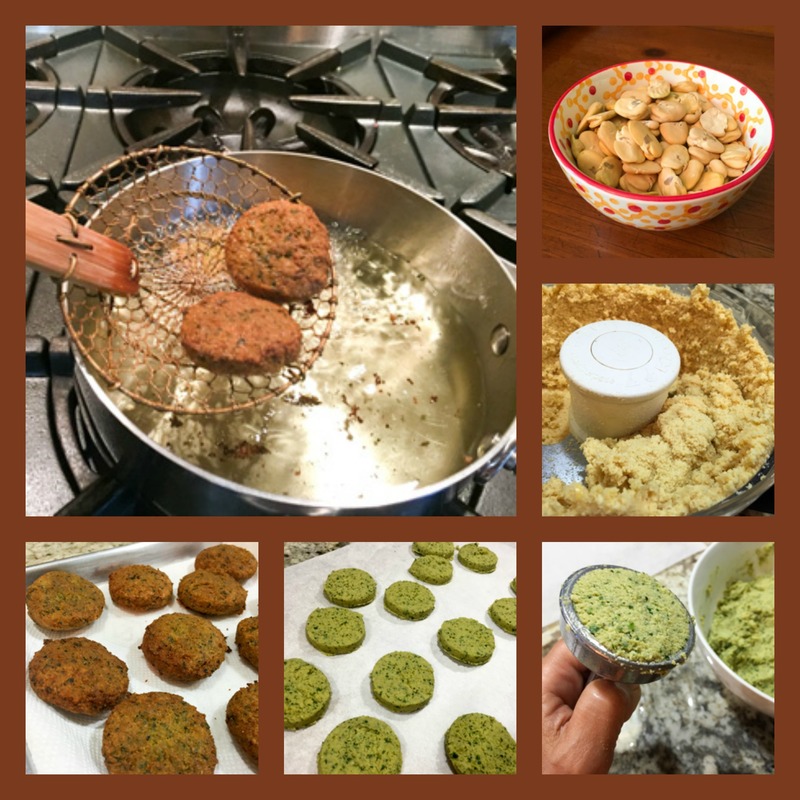 And now that we got the Falafel talked about, I must share with you a bonus recipe. 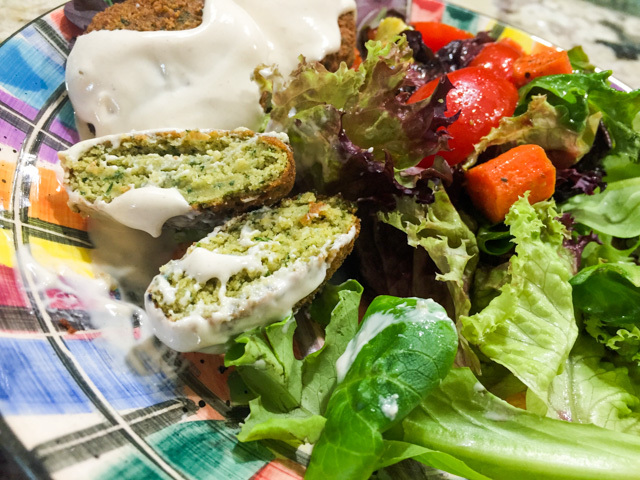 In part, I made it because I wanted to have a backup post in case the falafel turned into oily crumbs. But I am so glad I picked this salad, because it was one of the best things I cooked so far this year. 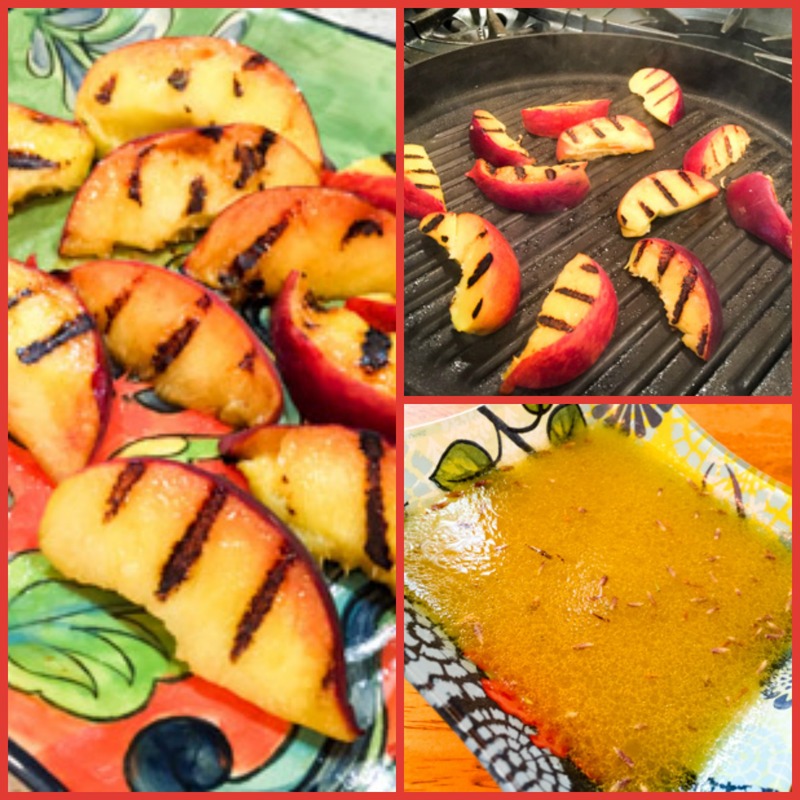 Grilled peaches ROCK! Make the dressing: In a bowl add the lemon juice, salt, mustard ,lavender, and balsamic vinegar and whisk Slowly drizzle the olive oil while you continue whisking until you have added the entire amount. 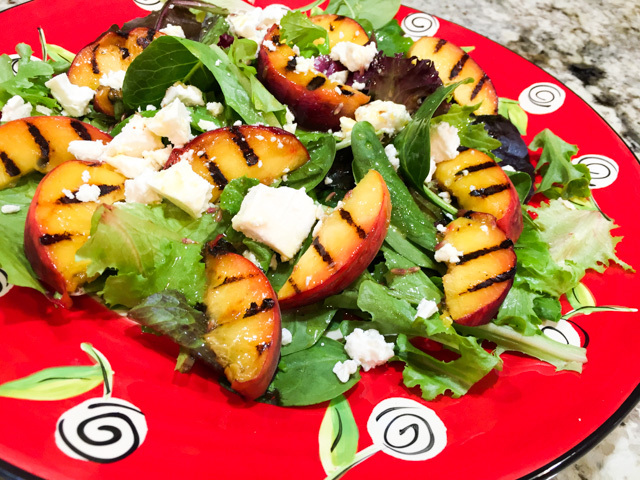 Prepare the salad: On the grill or in a pan on the stove top, lightly grill the peach segments. In your serving plate, arrange the greens, topped with the grilled peach segments. Crumble the feta cheese on top. Drizzle the dressing on the salad right before serving. 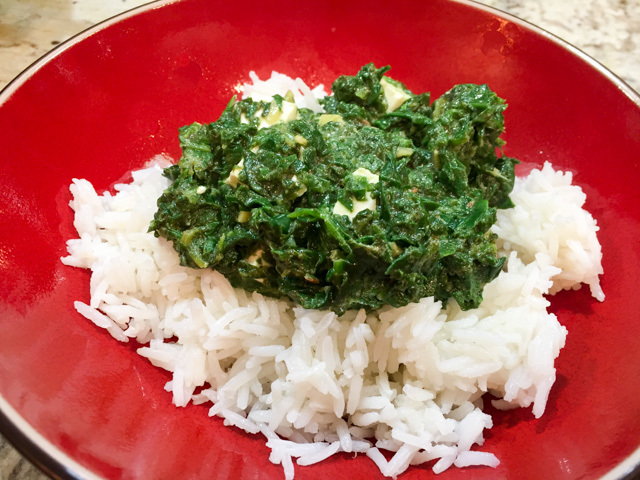 Sawsan, I cannot tell you how happy I was to get your blog to cook from! Having been a reader for so long, your place feels like home in the blogosphere… I hope you also enjoyed your assignment this month! Happy Reveal Day! I invite my readers to click on the blue frog. She will take you to the collection of recipes my virtual friends prepared this month. And of course, I wish everyone in the USA a Happy 4th of July! FOUR YEARS AGO: Amazing Ribs for the 4th of July! Recipes inspired by my travels through France, adapted for everyday simplicity and filled to the brim with nutrition. Mostly gluten and refined sugar-free, my recipes lean towards food that inspires, heals and nourishes, but above all else, it’s fresh, organic and simple. Place the orange in a pot and cover with water. Bring to the boil then reduce the heat to low and simmer for 1 hour. Allow to cool. Chop the cooked orange into chunks and place in a blender and blitz until smooth. Add all other ingredients (except cacao nibs and sunflower seeds) to the blender and pulse until combined. 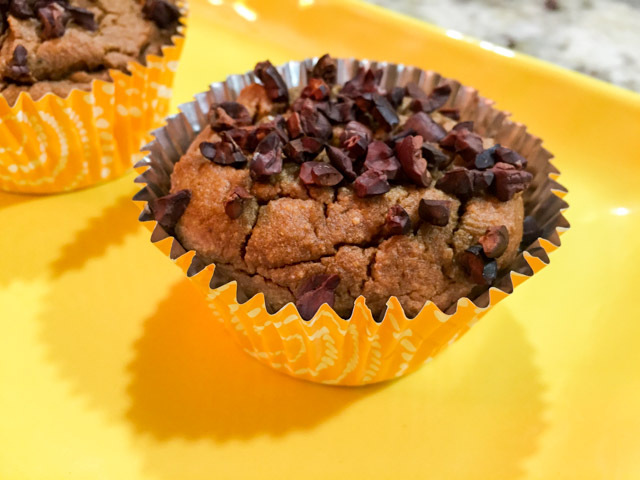 Divide the batter between your cupcake papers, filling close to the top as they will not rise by much, and top with the cacao nibs and sunflower seeds. Pop into the oven for approximately 30 to 40 minutes, or until a skewer comes out clean when inserted in the middle. Comments: As Leigh mentioned, the only tricky part of this recipe is to boil the orange. Tricky in the sense that you need to dedicate one hour for that step. Essentially hands-free, though. 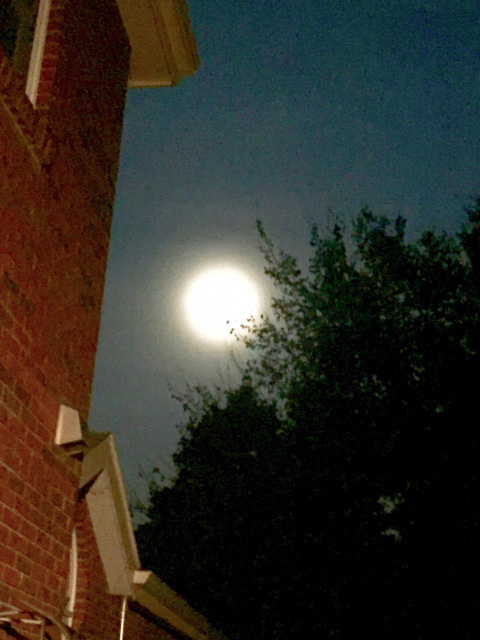 The smell in the kitchen as the orange simmers…. wonderful! Once the orange is ready and cooled down, the batter will be ready in minutes. Now, let’s talk about the “small problem.” The recipe made six cupcakes, enough for each of our lab members to enjoy, but Phil and I could not have any. In short, I made a recipe for The Secret Recipe Club, but never got to taste it. 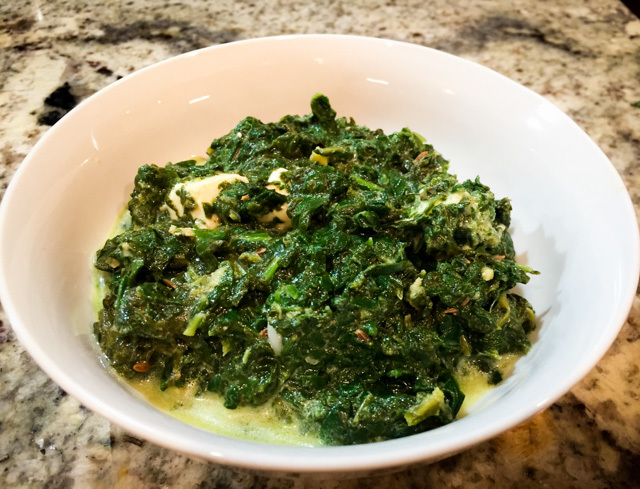 I had only one way to restore my dignity as a blogger: choose a second recipe from Chit Chat Chomp, and make it too… and that’s what I did, so today you get two recipes instead of one. How’s that for problem solving? Heat the oven to 325 F and line a standard loaf pan with parchment paper. In a large bowl, mix together the almond meal, arrowroot, salt and baking soda. In a separate bowl whisk the eggs lightly with the apple cider vinegar. 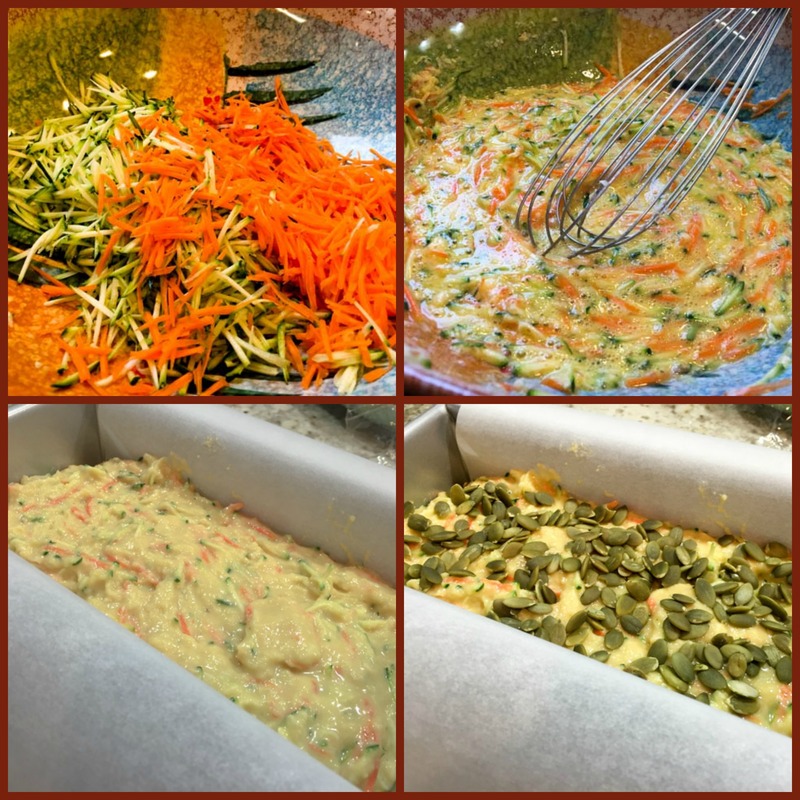 Add zucchini, carrot and cheese and mix well. Add the egg mix to the dry ingredients. Mix to combine. 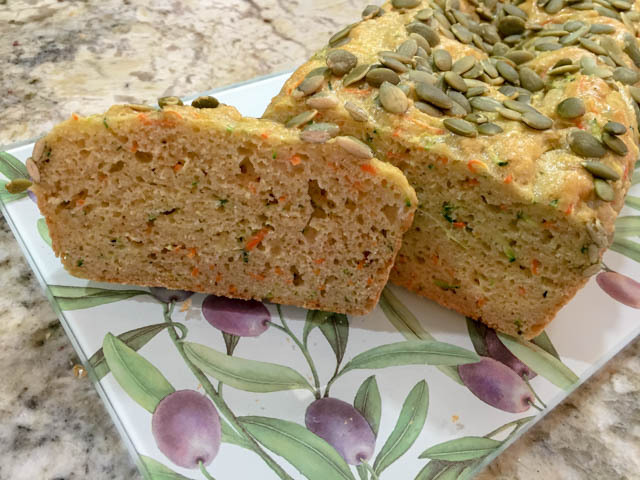 Pour the dough into the prepared loaf tin and sprinkle with pepitas. Bake for 35-40 minutes or until the top starts turning golden and a skewer comes out clean. Remove from the oven and transfer to a wire rack. Allow to cool for five minutes before cutting into slices. Comments: We loved this bread! It is obviously gluten-free, no regular flour, but the texture reminded me of quick breads, except that this had considerable more moisture. Not too dense like some gluten-free breads turn out. Leigh said it freezes well, but we did not get to test that, in three days it was gone. I enjoyed a slice at lunchtime, and was surprised that Phil did that too, he prefers his bread to be loaded with gluten. This one had so much flavor that the lack of wheat flour was not a big deal. 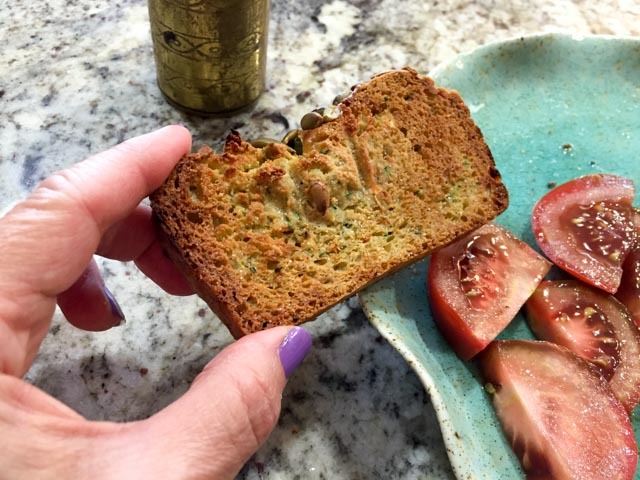 Once it sits in the fridge for a while, the best way to bring it back to life is toasting it… paired with juicy tomatoes, it was out of this world delicious! I wanted to try to make croutons out of it. Not sautéed because I am afraid they would crumble, it is a very delicate bread. But maybe spraying the croutons with coconut or olive oil then toasting them in the oven. I bet they would turn out amazing on a kicked-up version of Caesar salad, or over a massaged kale concoction. Definitely a bread to play with. I must say it was not easy to decide on which recipe to make as the bonus. I really wanted to make her Savoury Muffins, not only because the recipe enticed me, but for the write-up about it. You gotta go and read it… it has to do with France… And, if the weather was a little more appropriate, I would love a bowl of her luscious Carrot Soup… Another heavy contender was the Zucchini Noodle with Kale Pesto, which is pretty much my favorite type of meal these days. 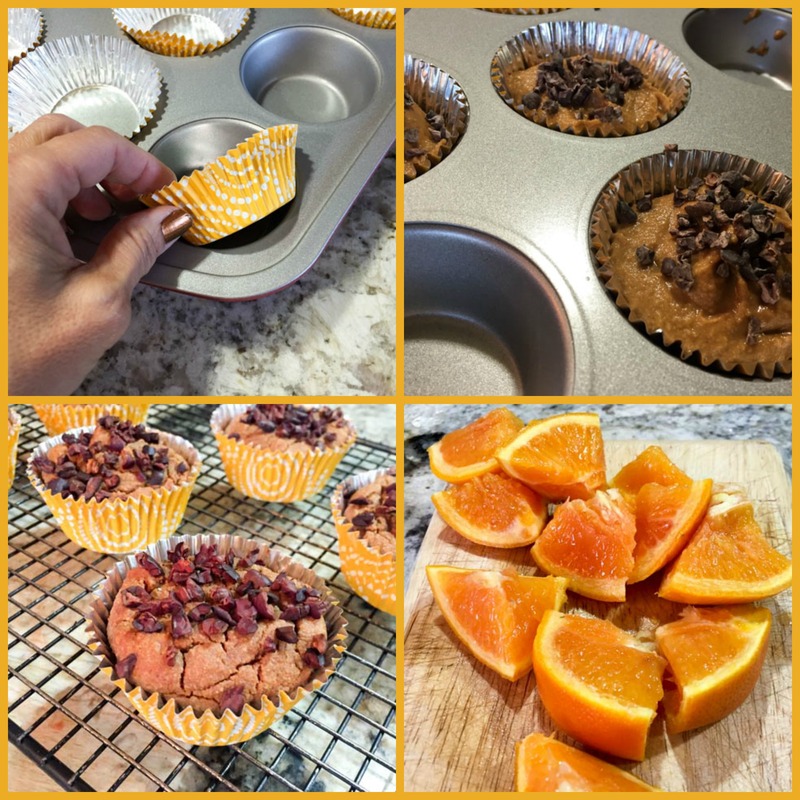 Leigh, I loved getting your blog as my assignment this month, and feel sorry I could not taste those cute mini-cupcakes… Thinking back, I should have made a double batch, but I only thought about it after they were all baked and I had no time to boil another orange and start over. It was getting close to bedtime then… oh, well. Such is life! Please make sure to click on the blue frog sitting patiently at the end of this post, so you can marvel at the posts that my virtual friends from Group A made for their assignments. 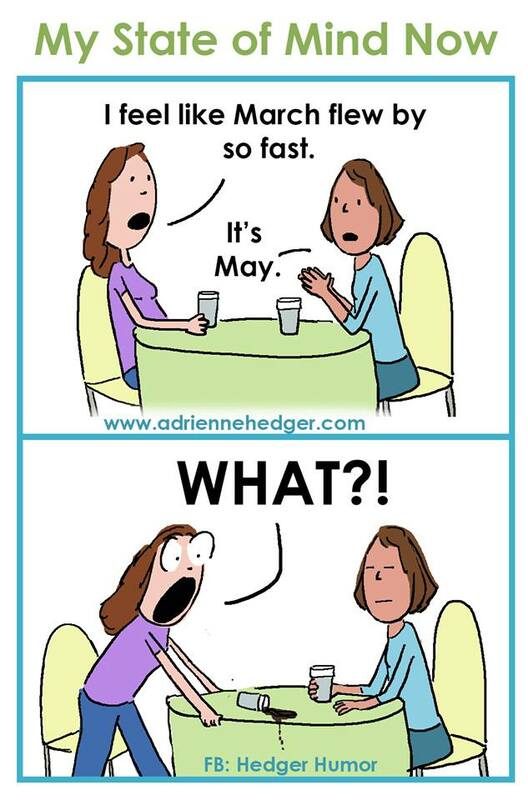 Adrienne, thank you again for allowing me to share your cartoon on the blog! Where towels are for drying, and the white spoons don’t go in the tomato sauce! Clearly, we have a lot in common, as I can be very protective of my kitchen towels. Just ask Phil… Come to think of it, I don’t own any white spoons, but if I did, they would never be allowed near a tomato, a beet, or a raspberry. Apart from keeping her kitchen pristine, Anna is a busy bee, and focuses on recipes that are easy to bring to the table and also delicious. Pretty much the way I cook most of the time. 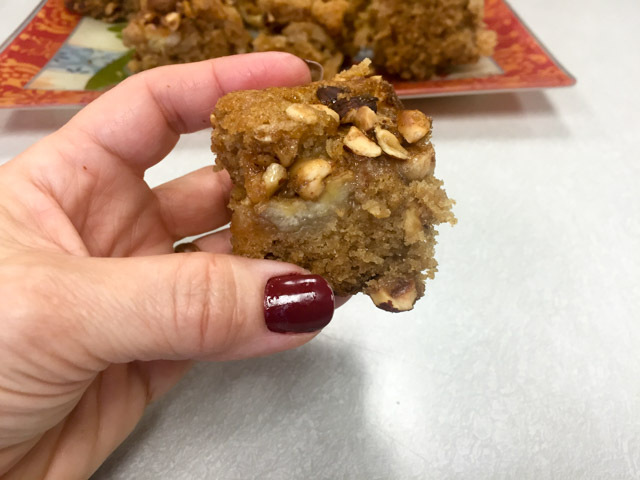 I bookmarked A LOT of recipes from her site, including her Slow Cooker Mac and Cheese, her Apple Bread with Pecans and Dried Cranberries (wow! ), her Rum Raisin Ice Cream (I absolutely must make this when the weather is right), her Snickerdoodle Bars (because anything Snickerdoodle makes my heart miss a beat), and her Crockpot Beef Carnitas Tacos (if you did not guess yet, the Bewitching Kitchen recently welcomed a slow cooker). 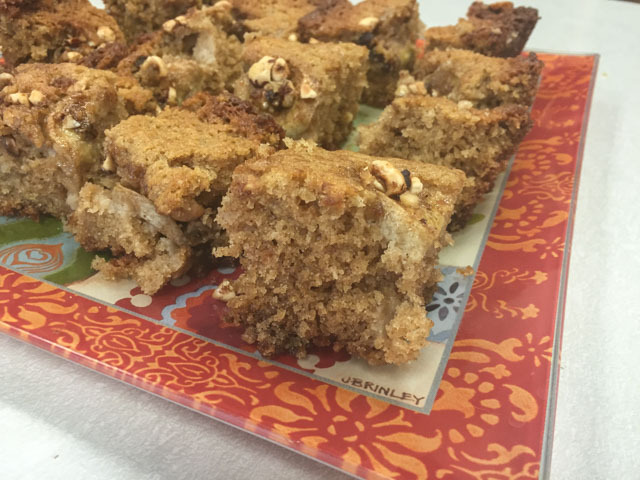 But, in the end I could not stop thinking about her Overnight Coffee Cake, perfect for making departmental colleagues happy! And now that the Reveal Day took place, can you believe that Anna got my blog? So we pretty much exchanged sites this month! 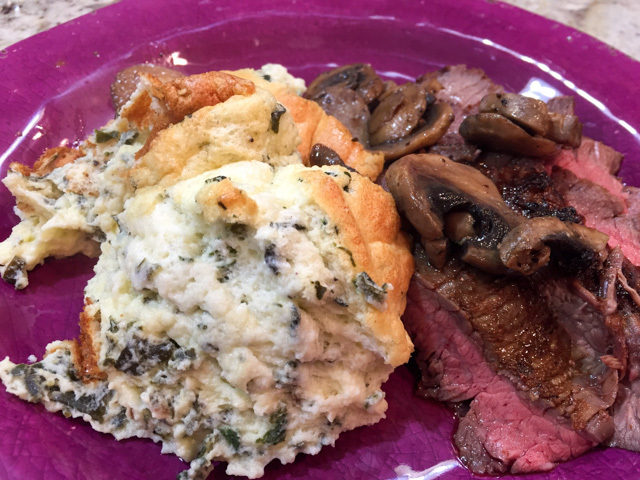 She picked a favorite recipe of mine, and composed a wonderful write up! Check it out here… Thank YOU, Anna! Cream butter and sugars until light and fluffy. Add eggs, one at a time, beating well. Stir in buttermilk. Mix flour, baking powder, baking soda, cinnamon and salt. Stir into butter/sugar mixture and mix well. 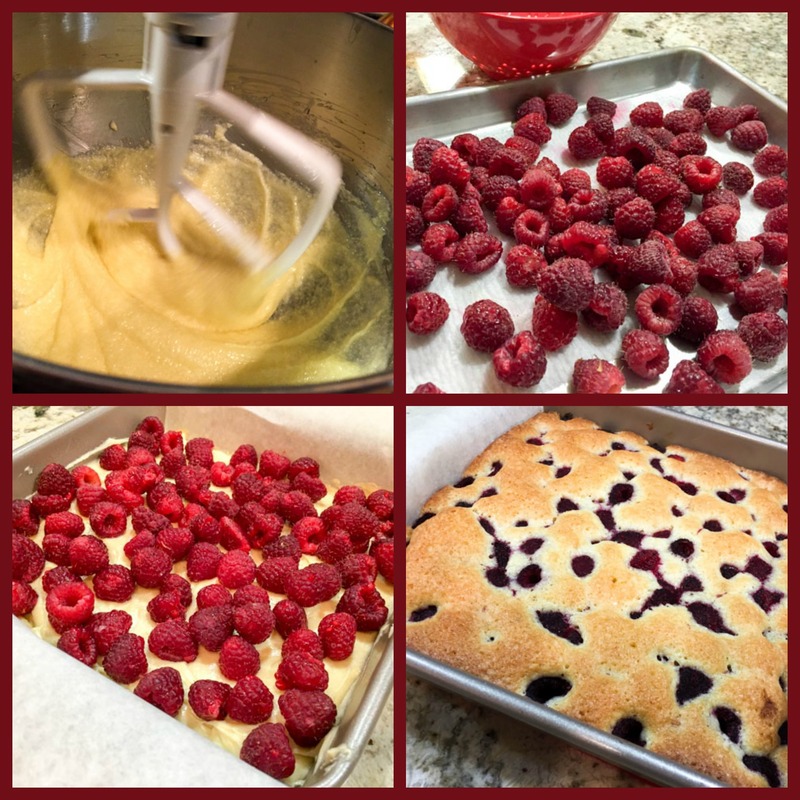 Spread batter into greased 13×9″ pan. Mix all ingredients for topping and reserve. 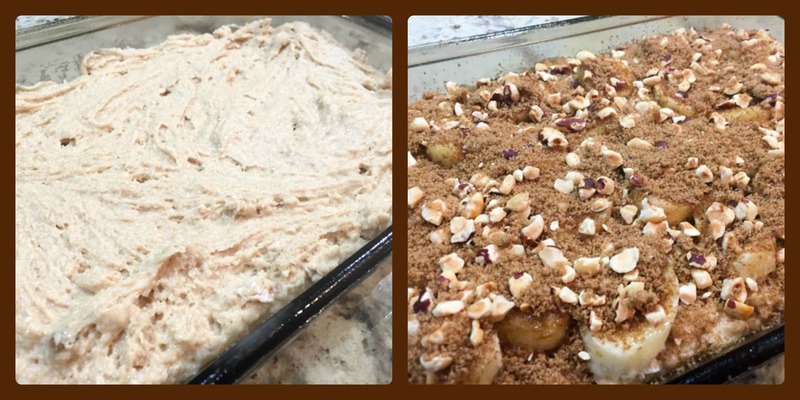 Spread the slices of bananas over the batter, and sprinkle the topping all over the surface. Refrigerate overnight or for at least 8 hours. Bake at 350° for 45-50 minutes, until a toothpick inserted near the middle comes out clean. 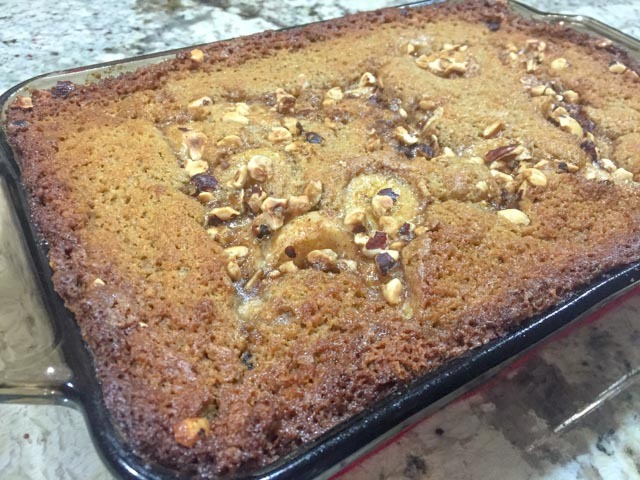 I’ve been making this coffee cake for a long time. It’s so convenient – mix it up the day or night before, refrigerate it overnight, and bake it in the morning. Warm fresh-baked coffee cake for breakfast or brunch. What could be better than that? Well, I sign below. And of course, her improvement to the basic by adding bananas on top was a strike of genius… As usual, this type of goodie is not easy to take a picture, but trust me, the taste is out of this world delicious! The bananas pretty much melt on top, forming a gooey entity with the sugar, but then the nuts add that pleasant crunch and next thing you know, the universe is smiling at you… What better way to start the day? Anna, I loved to “meet” you through SRC this month, and hope you had a lot of fun stalking your assigned blog too. For those interested in what my fellow secreters cooked up, please click on the blue frog at the end of this post, and have a blast! The corner piece with the extra crunch on the sides… irresistible!